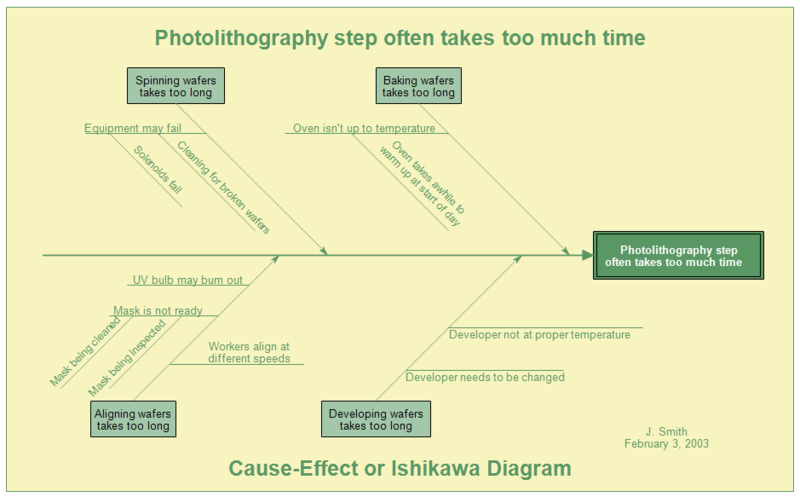 Description Cause-and-effect diagrams are also called Ishikawa diagrams after their creator, Dr. Kaoru Ishikawa. These diagrams are used in identifying and organizing the possible causes of a problem. They are sometimes referred to as fishbone diagrams because they resemble the skeleton of a fish, with a head, spine, and bones. The problem you are investigating is placed in a box on the right side of the fishbone diagram. It is labeled Effect in the diagram above. The spine is the large arrow going horizontally from left to right and pointing to the Effect box on the right. The lines diagonally pointing to the spine are the main categories of potential causes of the problem. Connecting to the central spine are the bones. These bones are all the possible causes of the problem. The smallest bones are the most specific causes. The bones are drawn in groups of related causes. Once RFFlow is installed, you can open the above chart in RFFlow by clicking on ishikawa-diagram.flo. From there you can zoom in, edit, and print this sample chart. It is often easier to modify an existing chart than to draw it from scratch. To draw this chart without downloading it, run RFFlow and click on the More Shapes button. Scroll to the Cause-Effect (Fishbone) stencil, click it, and then click the Add Stencil button.